"The creative process is a form of self expression, replete with experimentation, development of ideas, the practice of techniques and skills and exploration on a variety of levels". The creating process is a difficult one for artists who often practice breaking rules and pushing boundaries to create unique, expressive works of art. This ongoing challenge has increased dramatically because of the Internet. We surf the net, read books and attend exhibitions. Other artists’ visual interpretations are in front of us daily. With this ever present flow of information artists must keep in the front of their minds that while they can be inspired by other artists work, they need to take these inspirational elements and change them enough to make them distinct from the original. The concept of copyright can be very confusing. 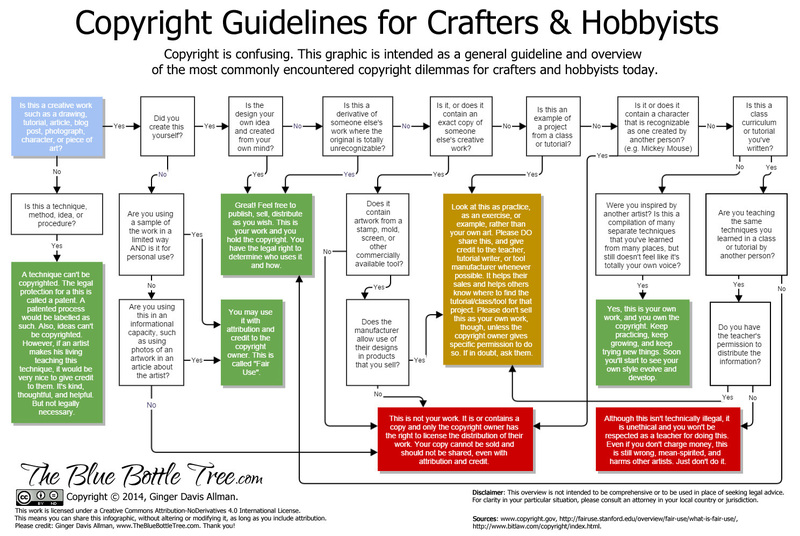 Basically, artists own automatic copyright on any work they create, but it only applies to the work in its entirety. Ideas and techniques are not protected by copyright. Images on the Internet, with or without a ‘copyright’ notation, are protected by copyright. Many artists working in mixed media or collage routinely appropriate portions of other artists’ works, incorporating them in their own work. To a large extent, this is allowed and is known as Fair Use. Another example of Fair Use is the use of images which are published as designs which are intended for you to copy, as in decorative painting and the current fad of adult colouring. These designs are meant for you to use for personal use only. While it is not illegal for an artist to make artwork that looks like someone else's (for their private enjoyment or learning), putting it out for sale can be seriously unethical. Sometimes this can happen unknowingly. If you see a great painting by another artist and then produce work which is very similar, you may be engaging in unethical behavior. It is permissible to give homage to another artist (with permission where possible) and to demonstrate your influences, but be aware of the gray areas of appropriation. Make it your own. Be inspired. Learn from others and twist it into your own interpretation. Speak with your own voice. An artist's work is protected by copyright, with a few exemptions.